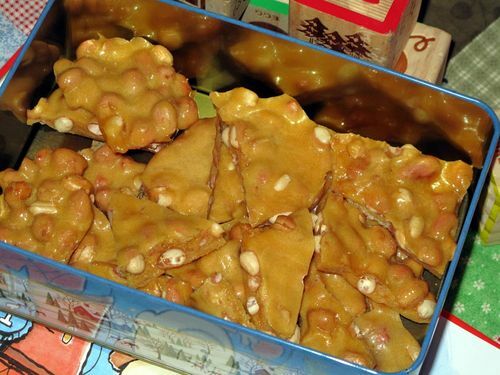 You will love this easy microwave peanut brittle. No need for a candy thermometer.....Yay! In microwave safe glass bowl combine peanuts, sugar, syrup and salt. Stir until combined. Stir until well combined and return to microwave for an additional 3 minutes. Add 1 TB butter, stir and return to microwave. Microwave an additional 2 minutes or until peanuts are golden brown. Add soda and vanilla until well combined and bubbly. Immediately pour on greased cookie sheet and spread to desired thickness. Let cool and break in pieces. Please be very careful and use hots pads when removing dish each time you microwave, it gets VERY hot. Store in decorative holiday tin and they are all ready for cute little neighbor gifts.